Timbernest Condos in Breckenridge Colorado real estate are nestled in tall evergreen trees, only a short walk to downtown Breckenridge’s historic Main Street. These exceptional Breckenridge ski condos are merely steps to the Quicksilver Super Six chairlift in the Warriors Mark subdivision on the south end of Main Street. Timbernest Condos consist of 24 privately owned residences ranging from one-bedroom to four-bedroom units, with lofts in the top floor residences. Each condo features spacious Trex decks to relax and enjoy the fresh mountain air. These Breckenridge condos include access to the Columbine Recreation Area. Amenities include a seasonal, heated pool, shower areas, indoor and outdoor oversized hot tubs and a summer patio – located just steps away from Timbernest Condos to unwind after a day of adventures in the mountains. Each unit also has private ski locker storage, larger units have assigned covered parking and all units have access to the on-site common laundry facilities. The Breckenridge FreeRide bus stop is steps from these condos – taking you throughout Breckenridge at no cost. 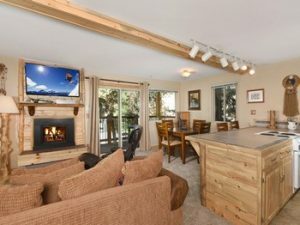 If you are looking for a condo for sale in Breckenridge that is ideal in the winter and summer for personal use or as a rental property, look no further than Timbernest Condos. Considering purchasing Summit County CO real estate but not sure what type of property or what town? Let Justin and Krystal Knott with LIV Sotheby’s International Realty assist you in finding your dream mountain getaway. For local market data, to inquire about a specific property or subdivision or to discuss your Breckenridge CO Real Estate search, contact the Knott’s at 970.333.9050.